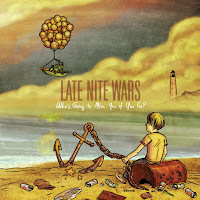 Late Nite Wars have certainly had enough practice leading up to their first full-length release, Who's Going To Miss You If You Go?. They've been together since 2008, played countless shows nationwide and have three E Ps to their name thus far. And with that experience comes the pressure to live up to expectations from both fans and themselves. So when the band entered the studio, they set a goal of completing a full-length album this time around. Quinn told Backstage Press. "From the start we were thinking about a record in its entirety, not a song by song basis. I think that's what brought out some creativity." The record certainly sounds like one solid piece. There are highs and lows, it's fast in spots and slow in others, but perhaps best of all, it sounds like LNW. The Merrimack Valley, MA outfit didn't pull any tricks on WGTMYIYG. Fans of the band's earlier releases will find comfort in this record knowing the band have stuck to their pop-punk roots. "None of us wanted 13 songs that had the same sound and structure," said Quinn, "however, we wanted to stay consistent to what makes us LNW." One listen through WGTMYIYG and it's easy to hear that the band are addressing a number of issues lyrically. What's it like to be a 20-something trying to find yourself? From working jobs you can't stand (which the band still do to support themselves), to failed relationships, the open road, touring and living in New England - the record is certainly eclectic in its message. "It's difficult to say exactly what the influence is for the record because all five of us bring something different," explained Quinn. "But lyrically, the setting is all New England. Many of the songs refer to the weather, and others refer to the landscape. The feel of the season can have such an impact that it's natural that it comes across in the lyrics." Perhaps that's most evident on the album's fourth track, "Rock, Paper, Bitters". The song opens with, "It's not hard to see that seasons change your mood/Just not as frequent as the weather/But it's cold and bitter, like these New England winters/It's coming on, and coming strong." Throwing their surroundings into their music is nothing new for LNW, who have, through all their releases, made an effort to pay homage to the life around them. Whether that's Boston, a local venue, an old college dorm or their favorite karaoke joint, LNW are a band that survive off their locality. And that sense of locality may be the driving factor in what keeps this band so connected to their past. Though WGTMYIYG may be the band's first full-length record, they made the decision to rework three of their previously released songs to fit onto the new album - an unmistakable shout out to their beginnings. With their last EP set as a precursor to the full-length, it was a no-brainer for the band to add "Work Isn't Working" and "Death By Routine" to the updated track listing. And as for "Dragon The Anchor", Quinn said, "we wanted to record it and see what it would sound like three years later. It's one of our favorite songs to play [live]." Who's Going To Miss You If You Go? has certainly solidified LNW as a pop-punk band that's here to stay. They've challenged themselves musically and lyrically, without losing sense of why they're making music in the first place. The band have certainly moved forward in their approach to leads, rhythms and vocals, but have left enough room to grow in the coming years. So what's the bottom line? Get to know LNW... now. To pick up the full-length album, released on Panic Records, click HERE. Also, make sure to grab the 7" vinyl containing two bonus tracks that weren't quite finished in time to make the May release. You can also stream the entire album HERE. Labels: 2011, Exclusive, Interview, Late Nite Wars, Pop-Punk, Review, WGTMYIYG, Who's Going To Miss You If You Go?